In the previous tutorial, we have learned the basic of Inheritance in Java. The term inheritance refers that one class can inherit all of the properties and behavior from another class. It is used for the code reusability. That means code once is written can be used again and again in the new classes. Let's proceed chapter. In this chapter, we are going to learn types of inheritance such as single, multilevel, multiple, hierarchical, and hybrid inheritance with practical example programs. 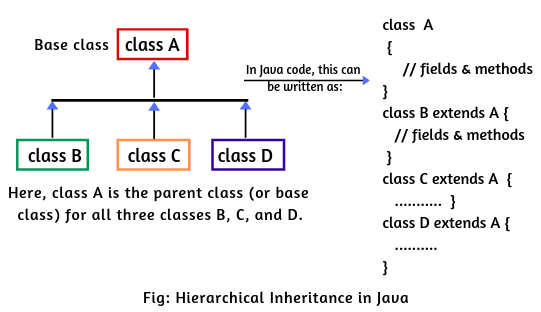 On the basis of class, there are three types of inheritance in Java. 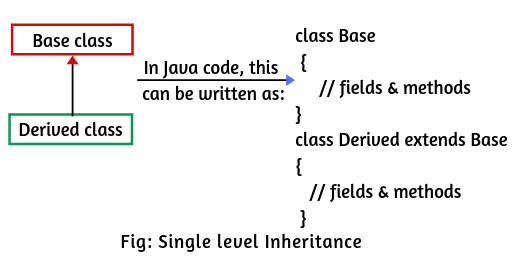 The classification of inheritance in Java is shown in the below fig. In Java programming. multiple inheritance and hybrid inheritance are supported through the interface only. We will learn interface in the further tutorial. Let's see a simple example program related to single inheritance in Java. In this example program, we have a class A in which a single function methodA(). The line class B extends A tells the compiler that B is a new class and we are inheriting class A in class B. This makes class A as the base class of class B and class B is known as a derived class. In class B, we have defined one function i.e one method methodB(). So it contains inherited members (i.e methodA() ) of class A and methodB(). In the main, we have created an object of class B and call the function methodA() which are inherited from class A and methodB(). A class which is extended by a class and that class is extended by another class forming chain inheritance is called multilevel inheritance. In multilevel inheritance, there is one base class and one derived class at one level. At the next level, the derived class becomes the base class for the next derived class and so on. This is as shown below in the diagram. As you can see the above diagram, class A is base class of class B (derived class), class B is the base class of class C (derived class). 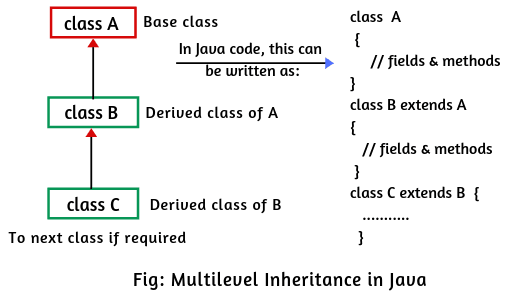 The above program demonstrates multilevel inheritance in Java. Class X is the parent class(base class) for class Y (child class) and class Y is the parent class for class Z(child class). Thus, class X is the grandfather of class Z(grandchild). The function methodY of class Y is inherited directly from class Y in class Z but the function methodX of class X is inherited indirectly from class X through class Y in class Z. One class has many superclasses is known as multiple inheritance. In other words, When a class extends multiple classes, it is known as multiple inheritance. In multiple inheritance, a subclass inherits from more than one immediate superclass. Java does not support multiple inheritance through class. Multiple inheritance is as shown in the below diagram. Practically, It is very rare and difficult to use in the software project because it creates ambiguity, complexity, and confusion when a class inherits methods from two superclasses with the same method signature. The ambiguity created by the multiple inheritance is called the diamond problem. But, the functionality of multiple inheritance in Java can be achieved by using interfaces. When two or more interfaces are implemented by a single class, only one method can share the method signature. Now, you need to understand why java does not support multiple inheritance. May get asked in the interview, especially for freshers. 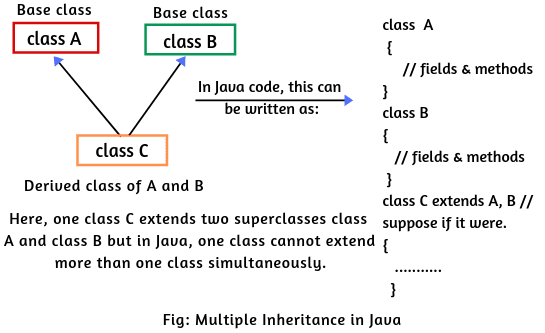 As shown multiple inheritance in the above diagram, one class extends two superclasses or base classes but in Java, one class cannot extend more than one class simultaneously. At most, one class can extend only one class. Therefore, To reduce the ambiguity, complexity, and confusion, Java does not support multiple inheritance through class. Let's see a simple scenario. Consider a scenario from the above diagram where there are three classes class A, class B, and class C. Class C extends two parent classes such as class A and class B. If class A and class B have the same method msg() (say) having different implementations. As per inheritance concepts, both methods will be inherited to class C. If you create an object of class C and call the method msg() from the child class object, which msg() will get called? So, there will create ambiguity and confusion to call the method msg from A or B class. Since the compile-time error is better than a runtime error, Java will give compile-time errors if you extend two classes. So, whether you have the same or different method signature still you will get compile-time errors. Let's understand how Java does not support multiple inheritance programmatically. How do you implement multiple inheritance in Java? Multiple inheritance can be implemented in Java by using interfaces. A class cannot extend more than one class but a class can implement more than one interfaces. Let's see how? Thus, we can implement multiple inheritace in Java. If you have any problem to understand the above program, you don't worry. When you will learn interface in Java, you can easily understand this program. A class which is inherited by many subclasses is known as hierarchical inheritance. In other words, when one class is extended by many subclasses, it is known as hierarchical inheritance. In this kind of inheritance, one class can be a parent of many other classes. 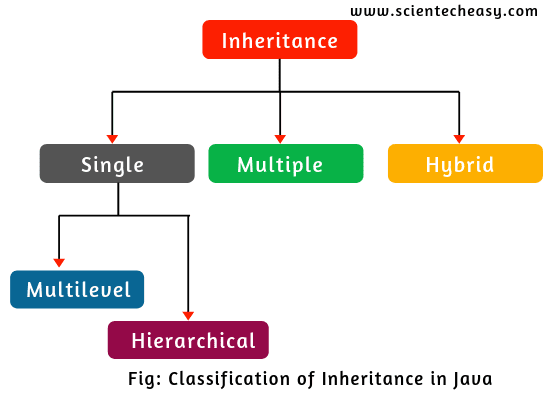 Hierarchical inheritance is as shown in the below diagram. In the above diagram, class A is the parent (or base class) of all three classes B, C, and D. That is class B. C, and D inherits the same class A and can share all fields, methods of class A except private members. Let's take one simple example program related hierarchical inheritance. 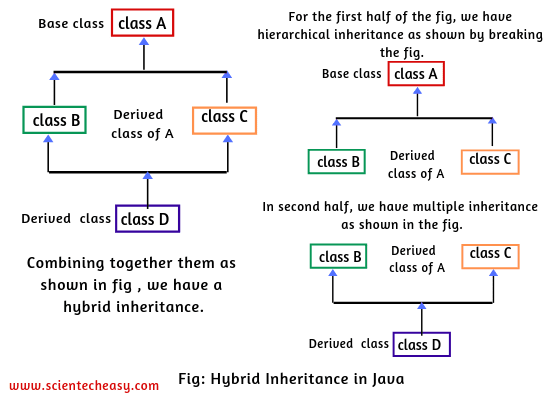 A hybrid inheritance in Java is a combination of single and multiple inheritance. A typical flow diagram is shown in the below image. A hybrid inheritance can be achieved in the same way as multiple inheritance using interfaces in Java. By using interfaces, we can achieve multiple as well as a hybrid inheritance in Java. It is not allowed in Java. Since Java does not support multiple inheritance through the classes so the program source code for hybrid inheritance will be discussed when we will learn the interface chapter. Note: Generally, we use three types of inheritance such as single inheritance, multilevel inheritance, and hierarchical inheritance in the project level. We do not work with multiple and hybrid inheritance. Hope that you have enjoyed the article types of inheritance in java. All the practical example programs are very important for freshers. The interviewer may ask one question from this chapter. So practice it.